A new topic for the new year! This practice of separating observational and discussion topics has been in use in the Osprey-topics for a few years now and is probably already known to many of our members. The discussion topic is open. Enjoy! Recently the VLC link has not opened the stream directly (for me; for some reason which i have not been able to fix). If you have similar problems but still wish to use VLC then copy the rtsp-address, open VLC, then open Media and play the Network stream from this address. The working hours of the camera will be different in different times of the year depending on the lighting conditions. The camera system is powered by solar panels which feed a battery. In order to save energy in the battery the camera is turned off for the dark time. First in the winter when days are short the camera will be starting at 7:30 and it will stop at 17:30 local time (EET). Later in the spring and summer the camera may be working even in the dark time of the night. Then we can make audio observations even though we may not be able to see anything. Please check the local time to see if it is night in Latvia when you try to open the camera and get no stream: the camera may be switched off during the night in order to save power. The Eastern European Time EET is 2 hours ahead of GMT (or Greenwich/London time); in summertime the daylight saving time adds one more hour to GMT. Edit: This link is not functional after the broadcast was changed to Youtube streaming. 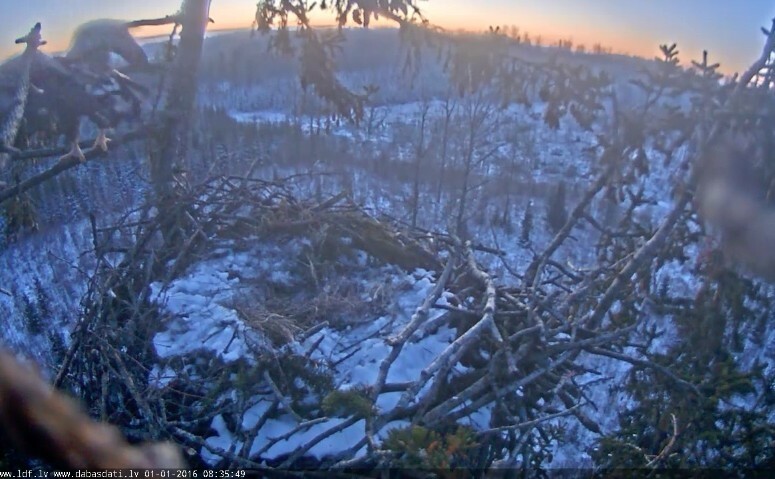 Ornithologist Jānis Ķuze of Latvian Fund for Nature (Latvijas Dabas fonds, see also Dabas Dati, http://dabasdati.lv/en/dabasdati.lv/ ) and Latvian Ornithological Society, gave an introduction to the nest camera in the beginning of season 2015 when the live camera first started at this nest. 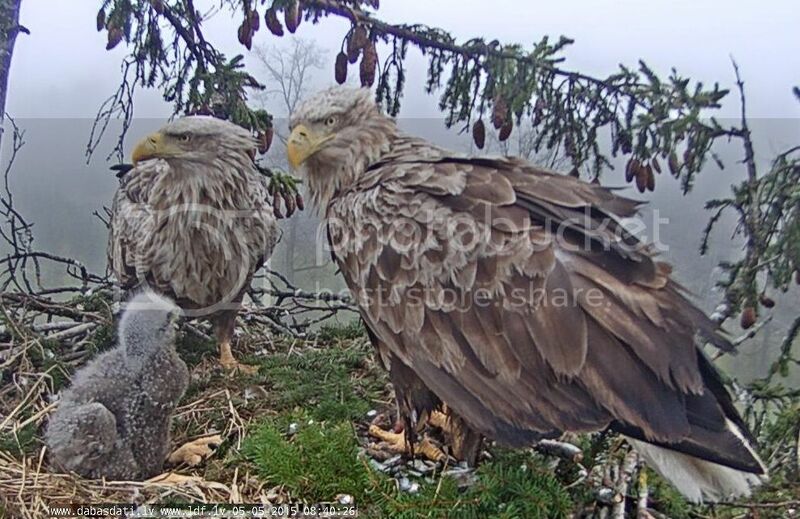 The nest of White tailed eagle that is equipped with webcam system is located in W part of Latvia in Durbe County. It is a new breeding territory, known only since summer 2014 when first nest of this pair was found. It was built in the retention tree – pine tree that was left in the clear felled area. 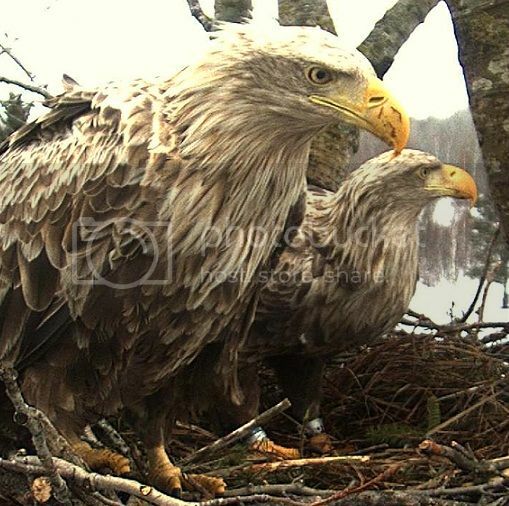 Pair bred successfully that year – it was one of the four known nests in Latvia in 2014 with three youngsters. 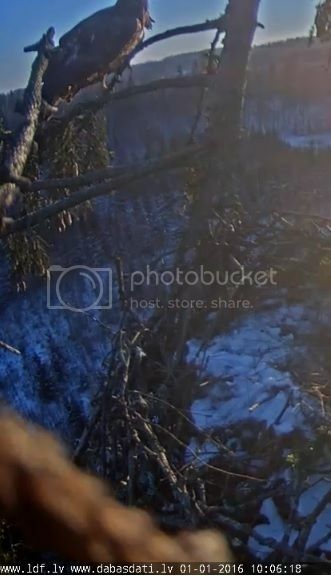 This year eagles started to build a new nest in the nearby spruce tree on the wind broken top. 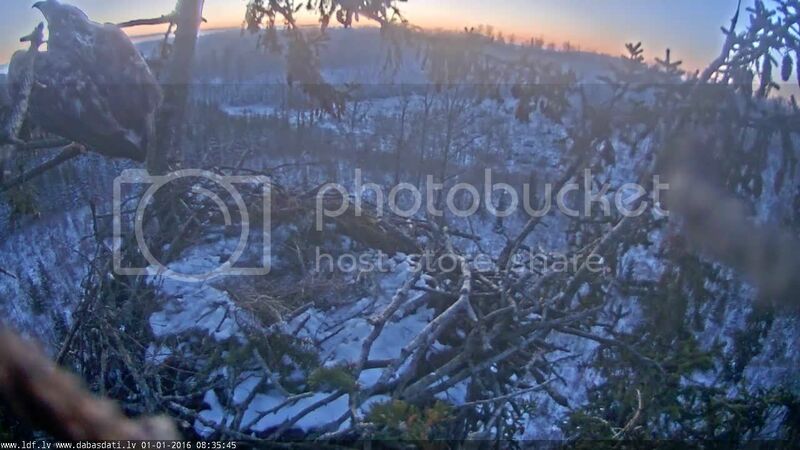 Several of the top-most branches are growing upwards now, thus providing a support for the eagles nest. 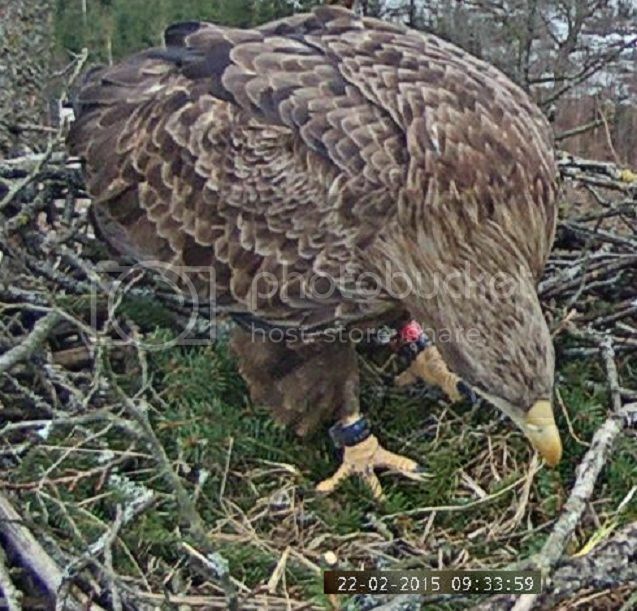 Camera was installed at one of those branches at the early stage of nest building process, giving us a rare opportunity to watch the process of building of new nest (so far the webcams were placed mostly at White-tailed eagle nests with previous breeding history). Soon we discovered that the female is ringed, on left leg it has a ring with code K404 and colour combination “blue over red”. On right leg it has a ring with colour combination “blue over white” that points to the Estonian origin. Colleagues from there informed us that this bird was ringed as a nestling in the nest in southern part of Saaremaa Island in June 1999. Origin of the male is unknown as this bird is not ringed. This nest is interesting with its location in the spruce tree. It is only fourth historically known nest in Latvia that is built in spruce (roughly half of all nests are built in pine trees, one third – in aspen trees, one tenth – in birch trees; more seldom spruce, oak and black alder is chosen). 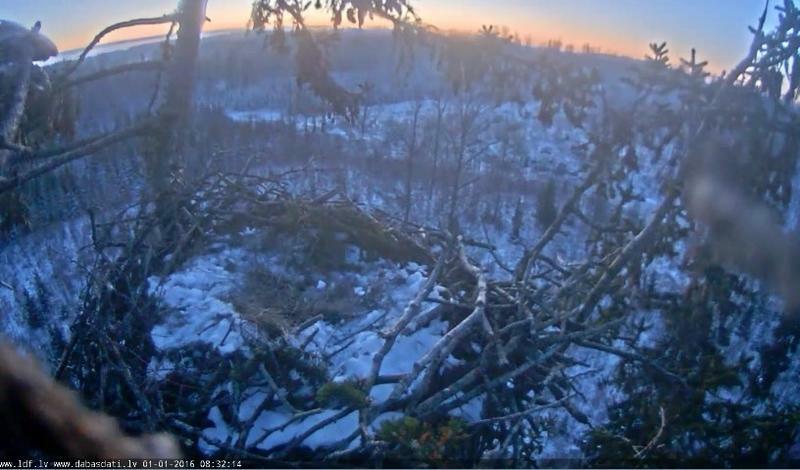 “Spruce nests” are usually built on such broken tops and are located high above the ground (in this case roughly 25 meters) – the highest nest of White tailed eagle in Latvia is located 31,5 meters above the ground and is built in spruce as well. In the first half of February we can see the intensive nest building process where both of the birds are involved. If breeding will be started, eggs (1-3) could be laid in the end of February or in the first weeks of March (in rare cases it happens as late as in early April). Incubation usually lasts for 38 days; the young birds are going in their first flight in the age of 2 and a half months. Project is implemented by the Latvian Fund for Nature. This year the transmission is possible thanks to the LMT (data transmission to the server), Mikrotik (4G routers), EENET (server), Janis Rudzitis and SIA “Rewind” (system configuration) and LatRosTrans (financial support). ... the bird is ringed on 18.06.1999 in Southern part of Saaremaa, ringer Veljo Volke. Saaremaa is the big island on Estonia's West coast where also the seal island is situated. Thank you for the introduction, Jānis Ķuze! The location of the nest is in Durbe County near the city Liepāja in Western Latvia, shown in the maps below. The maps were provided by Jānis Ķuze. There is one big lake, Durbes ezers, with a nature reserve area. There are also other water areas in the county. "We just got a message from the State Forest Service - nest is officially established microreserve! It is surrounded by a wide buffer zone in which forestry activities are not allowed during the nesting season. Thus, from the forest to disturb the work, this place is now protected." We may get some clues about the location of the nest from what we see and hear over the camera. Based on these clues it is possible to narrow down the location of the nest in more detail. We ask every one of you to keep all further information about the location to yourselves. Please do also not share any further information about the location anywhere in the internet, not in this forum nor anywhere else. More detailed information of the location of the nest may encourage some people to go and seek the nest in nature. Nest tourism like this is the last thing that is needed here in the delicate breeding time. People near the nest may frighten parents away from the nest and leave eggs or chicks unprotected from weather and predators. Thus an intrusion may lead to destruction of the clutch. In the EENET server there is the so-called Pontu archive where material recorded with the EENET nest cameras is saved. The streams themselves are recorded and the videos are saved in this archive. Also a high-resolution still picture is taken each minute and saved separately. These still pictures are called Pontu pictures and the video recordings are called Pontu videos. The Pontu archive may be accessed by the public and both still pictures and videos may be downloaded from there. A similar recording system is operational at each EENET- bird's nest camera. There you will see a list of different camera folders in time order from oldest to newest. Clicking a name in the list opens the corresponding archive. 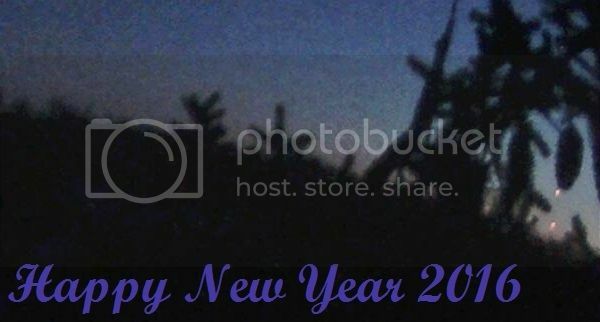 The example folder contains pictures taken on Jan 1st 2016. Clicking the name will open the folder. There will be a list of names of the pictures and clicking on the name will open the picture for viewing. The name gives the camera's name (here juras-erglis) and the start date and time of the recording (in this example the video begins at 5:34 on Feb 8th 2015). Clicking the name will open the video either for playing (not recommended for large files!) or downloading (this will take a long time, too). After the name in the next column in the list there is a time marker (the meaning of which I don't know) and the number in the last row tells the size of the video in bytes. The live stream is being recorded continuously and these video recordings are saved in the Pontu archive (some technical malfunctions may cause few exceptions in this). Therefore video material from the nest cameras is available also afterwards. These Pontu videos are normally 4 hours long and therefore very large files (typically from 2 GB to even nearly 4 GB), so they need a lot of disk space. Downloading of such files also takes a fairly long time (depending naturally on the data transmission rate). One should note that the last video file in the list is still being recorded and thus without an end-marker. Downloading such a file gives an incomplete and possibly partly unmanageable file. Refreshing the Pontu archive bookmark will show if the recording of the file has stopped: the size of the file will not increase any more. or ask ame or aita for assistance. If someone knows other practical ways of handling these mkv-files please write a description of your procedure there! The live camera takes high-resolution still pictures of the nest once every minute for the archives at each EENET- bird's nest cameras. The still pictures can be found in the archive where are stored in daily folders as described above. All other values than the year are given with two digits. Note that the date appears in the address twice. Note also that the address is case sensitive: for example an address with 'jpg' as format will not open a picture. In the above example 2015-02-11 means February 11th 2015 and the time -15-36 means 36 minutes past 15-hours (that is 3 pm local time). Editing the date and time correctly will open the desired Pontu picture. If the picture is not found even for a seemingly valid address the time may be too early or too late: pictures are usually taken and stored only in the light time of the day. It is also possible that due to technical difficulties some pictures are simply missing. In the address above 'juras-erglis' refers to the Latvian WTE nest. For other nests this part should be changed, for example to 'kure' for the black storks Tiina and Tiit's nest camera, or 'tooni' for the other black stork's nest which was in recent years been inhabited by lesser spotted eagles Tuuli and Remo. The exact addresses will be given in the beginning of each nest topic. Thank you Debianuser for the tool! It works with the same principle as the Estonian Pontu archive. 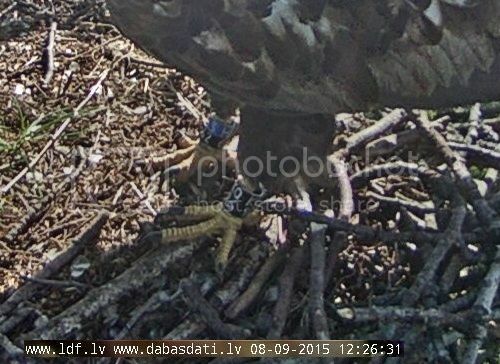 The nest is built by couple where the female wears Estonian rings: on the right ankle a blue-over-white ring. 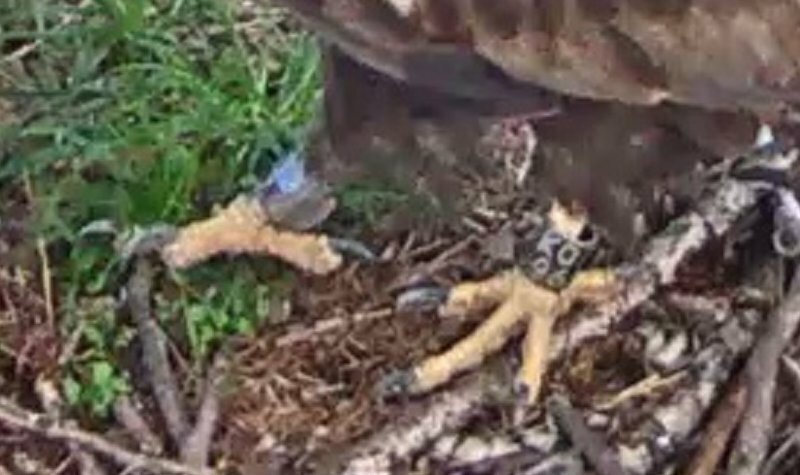 On the left leg the female has a red&blue year ring with an individual code. Jānis Ķuze and his co-workers read the code: K404. The colours and the letter K tell that the female was ringed on 18.06.1999 in Southern part of Saaremaa, Estonia. The male has no rings and therefore it is impossible to know anything of his origins. The Latvian dabasdati forum members named the eagles on Feb 13 2015. The female was called Durbe and the male Robert. 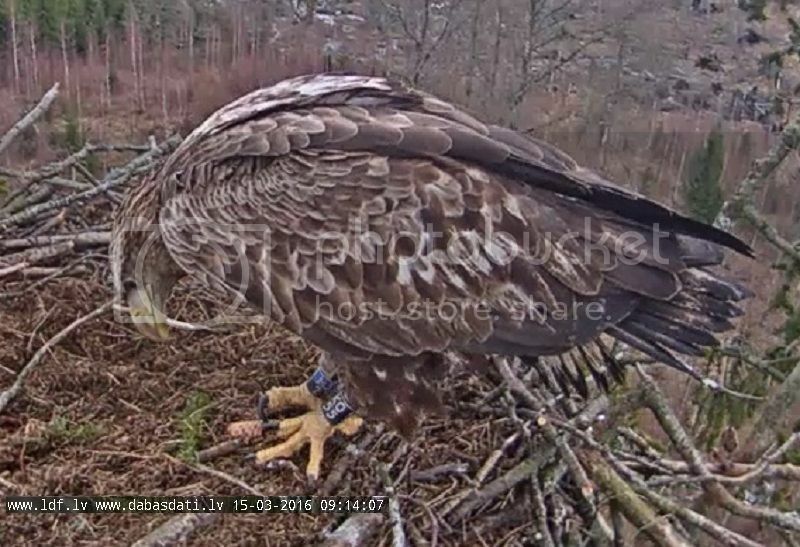 In this picture Durbe is feeding Durbertina, the chick of 2015. It can be seen that there is number 4 on both sides of the letter K.
Durbe was seen on the nest for the last time on 29 Dec 2015. After that the camera was off for a long period and after the camera repair Robert was only seen alone. Several strange adult eagles visited the nest during January. It is difficult to say exactly how many because none of them had rings. 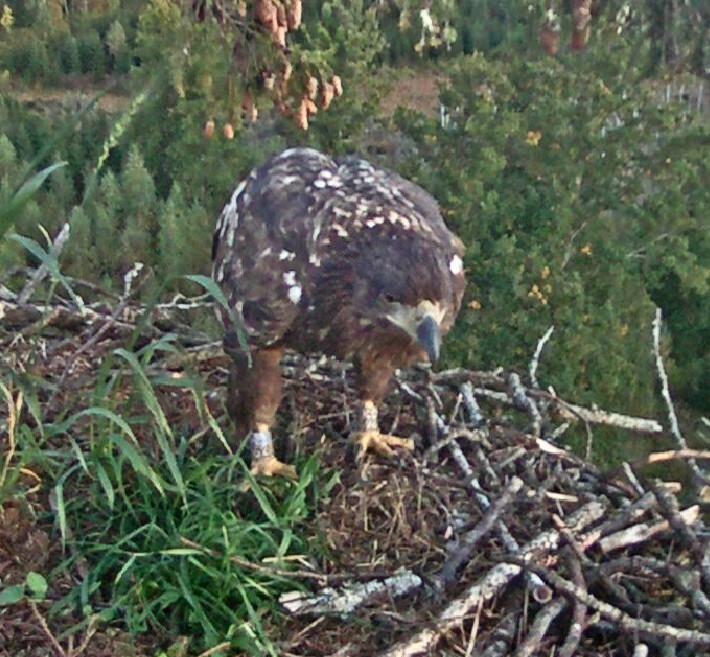 On 1 Feb 2016 Robert came to the nest limping his left foot. The foot had probably been injured in a clash with one of the strange eagles who were pursuing to take over the territory. 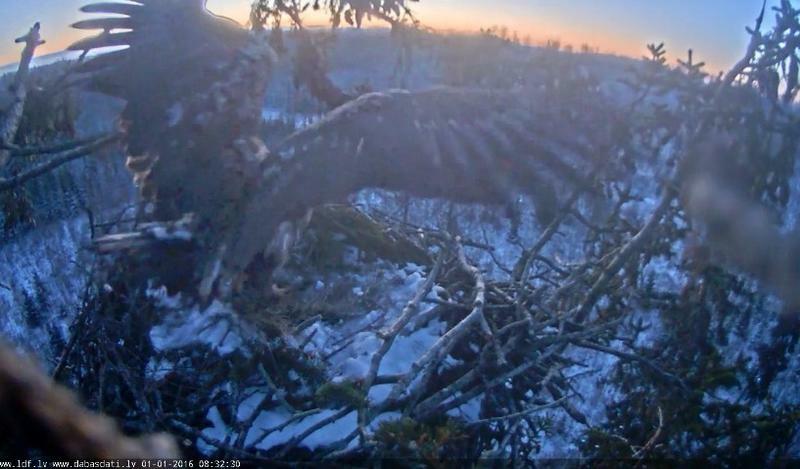 A new female had joined Robert in chasing strange eagles away from the nest. It seems that Durbe, the ringed female of the nest perished during the winter and that the new female tried to take her place. The new female seemed to be determined to settle in and become Robert's new spouse but Robert didn't seem to accept her although he didn't seem to be able to get rid of her either. 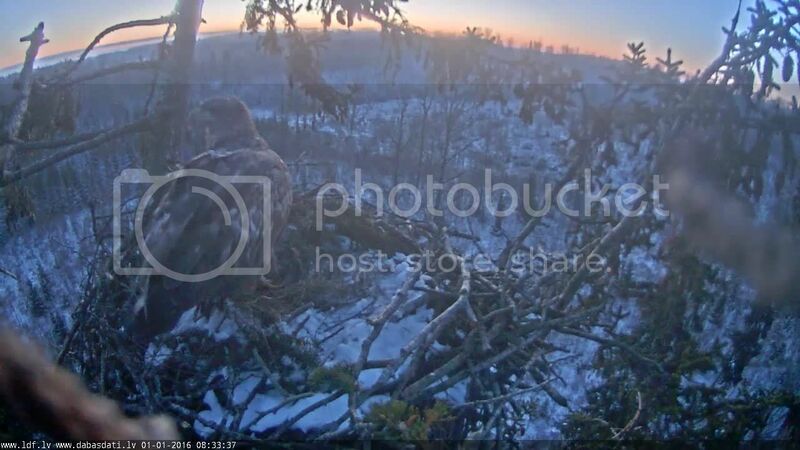 Robert was seen on the nest for certainty in the morning of Feb 22 for the last time. On the same evening his new bride visited the nest briefly alone. Among the strange eagles was a couple who often came together and seemed to be very close to each other. It seems that during the month following the disappearance of Robert this young couple has been able to establish their ownership of the territory and the nest. They seem to be be very inexperienced in all breeding activities including nest building and mating. The first possibly successful mating was seen in the morning on March 28. A day before this the members of the Latvian Dabasdati forum had decided to give them names: the female was given the name Egle and the male Ansis. - Later in April this young couple separated and left the territory. 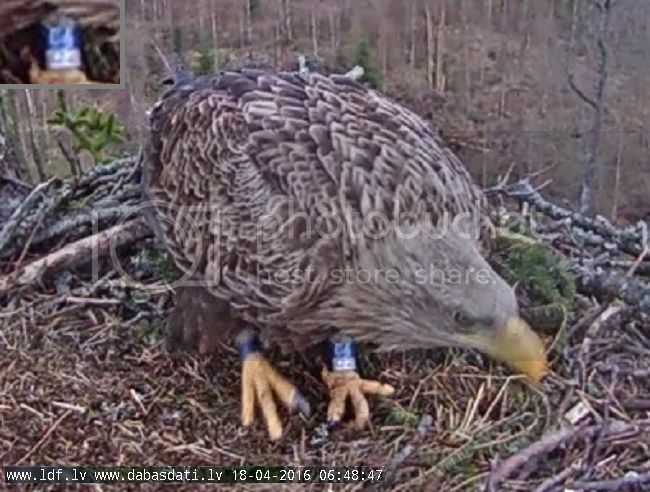 On April 17th a Latvian eagle C602 with number code 221 was identified on the nest. Probably the same bird was seen already on March 29th but then only the first two characters on the blue stripe of its ring, C6, were seen. This eagle began to visit the nest on a more or less regular basis. On July 29th a Lithuanian eagle with ring code B556 arrived together with the Latvian C602. They seemed to get along well from the beginning: For example they landed simultaneously "hand in hand". From then on they started to come to the nest together. Based on their voices it was concluded that C602 is a male. He had found a girlfriend and brought her to the nest. In the autumn they began to rebuild the nest. On Oct 16th the Dabasdati forum named the female Šilutė and the male was named Vents. Reading of the ring codes gives an absolute identification of an eagle if the eagle has rings. Last year the female Durbe had rings on both legs, a white&blue on the right leg and red&blue with readable code K404 on the left. Especially during the nesting season just seeing a ring on a leg was enough to know that the Lady of the nest was at home. Some conclusions can be drawn from the way the eagles behave on the nest. Strange visitors have often looked uneasy or slightly restless on the nest. The resident couple, on the other hand, feel and look like they are at home: they are calm and relaxed. This applies especially if both are in the nest: the spouses feel comfortable with each other and act accordingly. If a stranger is near the nest the reaction of the owners is repelling and aggressive. Identifying eagles without rings individually is a very difficult task but their plumage gives clues. Young eagles have have their individual plumage which depends on their age but also varies from one eagle to another eagle of about the same age. Adult eagles are more difficult to separate from each other since they look very much alike. In the following are listed some tips which may be helpful in identifying and separating between different individual eagles on the nest. The tails of adult white-tailed sea eagles are, as the name suggests, white. In their white tails eagles also have black spots which form individual and (more or less) permanent patterns. Comparison of these tail spots makes it possible to identify or separate eagles individually at least to some extent. One must remember, however, that these markings will look very different depending on whether the tail is folded or spread wide open. Sometimes some feathers may be hidden or molt may temporarily remove a spotted feather. This will change the appearance of the markings. Another possible but a much more unreliable way to separate between sexes of eagles is their head shape. The foreheads of females are fluffier and rounder than the heads of males who tend to have a flatter profile. The difference in the profile is mainly based on how abundant the head feathers are and how erect they are. The profile is not, however, a certain way of separation between sexes because birds can raise or lower their head feathers according to their mood or alertness. In lianaliesma's picture the shapes of Durbe's and Robert's heads follow this "rule of thumb" (first picture in this post). Here another picture where the shapes of Durbe's and Robert's heads are according to the general "rule": Durbe has fluffy head feathers pointing high and round and Robert has flat head feathers. On the other hand here below are some pictures which illustrate the difficulty of identification by head shape only. It is very difficult to say who is male and who is female if one does not know who in these families wears rings. Here are two consecutive Pontu pictures of the male Robert, taken one minute apart. In the first picture his head feathers are flat and in the second picture one minute later he has the feminine 'hair-do': head feathers stand up making his profile fluffy and round. One possible way of separating between female and male eagles is to compare their sizes. Like in most species of raptors females are bigger than males. Usually one needs to see the spouses side by side so that comparison is possible. In the Juras-Erglis nest 2014 the size difference of the female and male was so large that it was possible to see who was who even when one of the parents was on the nest. Robert is, however, almost as big and Durbe. The camera also 'flattens' the depth of the nest view so that birds on the front and back of the nest seem to be equally far from the camera, but the more distant bird looks much smaller compared to the closer one. This makes sometimes the size comparison deceiving. The voices of female and male eagles sound different. In human terms one can describe the tone or register of a female eagle an alto and that of a male eagle a tenor. The difference is usually easily audible when spouses sing together: the female voice has lower pitch than the males. Again comparison of two voices is easier than hearing a single bird singing. The difference is possibly due to the overall size difference of sexes. The female is usually bigger than the male and thus she probably has larger vocal organs with longer vocal cords which naturally produce lower-pitch voices than shorter vocal cords. 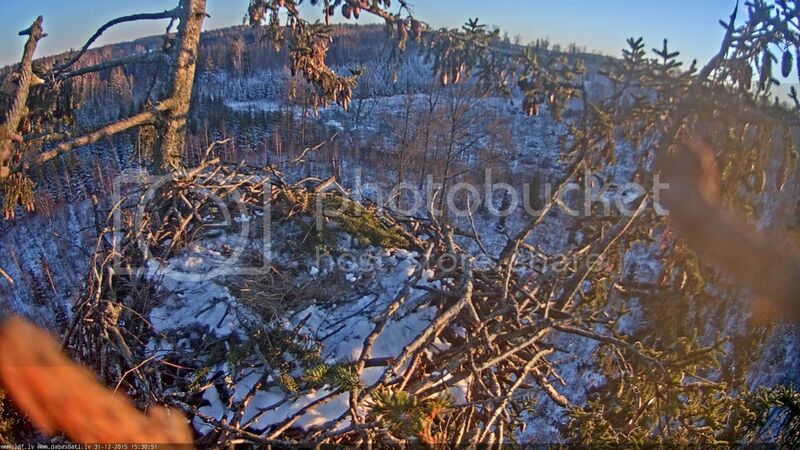 The nest is built in the top of a spruce which has been broken possibly in a storm many years ago. After that several side branches have started to grow as replacement tops. The biggest branch on the right of the nest in these pictures has won the race of becoming the new top. A spruce as a nest tree is rare because normally the branches slant downward from the trunk. Branches like this do not form a stable basis for a nest which may eventually weigh tons. The top of this spruce forms a secure basis for the nest: the nest sits in the top like in a palm of a hand with fingers pointing up. Tringa gave us photographs of the nest tree. Thank you Tringa! Apparently these pictures are taken from the direction to which the nest camera looks. In the picture below is the view from the camera at 15:30 on Dec 31st 2015. The big branch which has become the replacement top is on the left of our view. 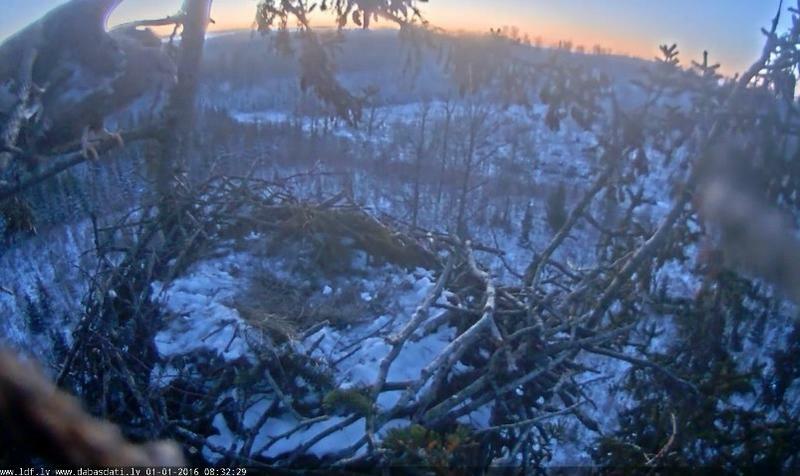 The camera is probably attached to the branch which in right in the centre of the above picture, on the back side of the nest. Dabasdati.lv is a non-commercial Latvian nature information portal with a forum like Looduskalender. Some websites where one can see the weather forecast for Durbe county, Latvia. Here the location is set to Durbe, Latvia. Just change the time. Note, that the program requires the UTC time which is 2 hours less than local time in Latvia (in summer time 3 hours). 2.1. The camera suffered a malfunction after which only audio signal was transmitted. The picture was black and also the time stamp was missing. Despite of this hardship the observations based on audio continued, although severely impaired due to the missing picture. 1.2. 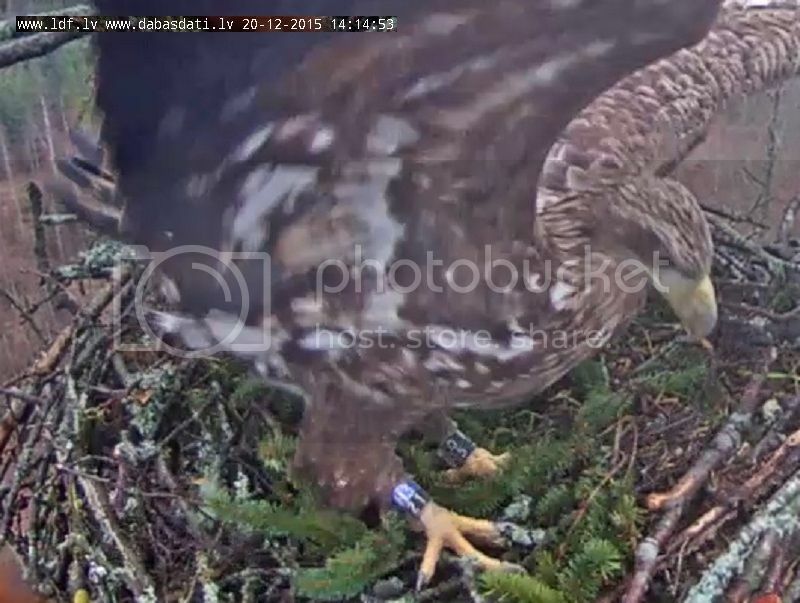 Robert was seen on the nest with a foot injury which made him limp. 15.2. 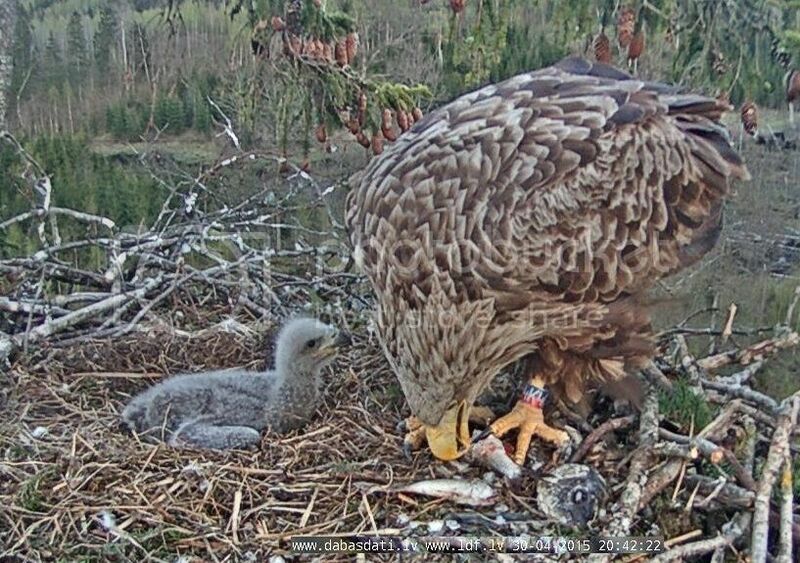 A nearly-adult eagle arrived on the nest together with Robert. The eagle looked bigger than Robert so it was believed the the new eagle was a female. She settled in and started to act as the mistress of the nest. Robert looked apprehensive of the new companion but did not chase her away. 10.3. Limping Robert was seen on the nest for certainty for the last time together with his new bride. His bride visited the nest alone in the evening. 11.3. Robert's bride came alone to the nest in the morning for a brief visit. It hasn't been seen since for certainty. 27.3. The young couple who have seemingly conquered the ownership of the territory and the nest were named by the members of the Dabasdati forum. The female was given the name Egle and the male Ansis. 28.3. Egle and Ansis were seen mating probably successfully for the first time. This possible success was preceded by many failed attempts which seems to indicate that this couple has never bred before. 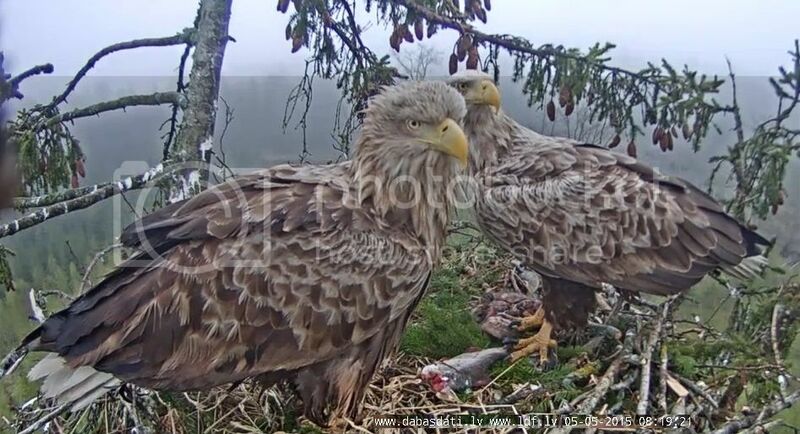 Later in the spring Egle and Ansis stopped coming to the nest. 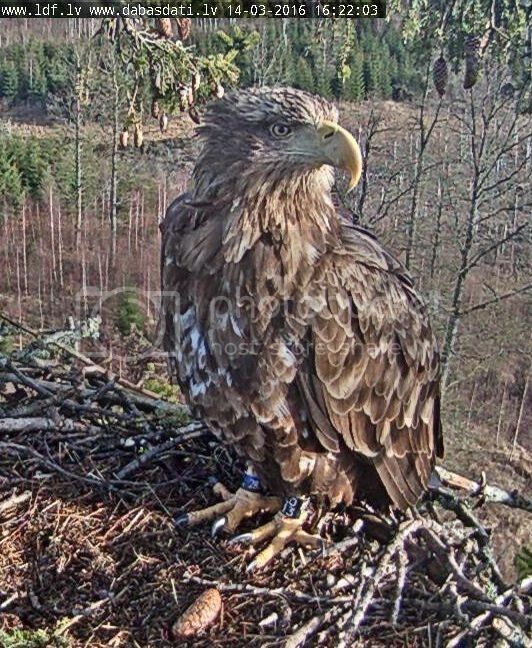 Apr 17 a new male with Latvian rings C602 was identified on the nest for the first time. He started to come to the nest more or less regularly and he settled in. On July 29 he brought a girlfriend to the nest: a Lithuanian B556. They seemed to get along very well from the very beginning. 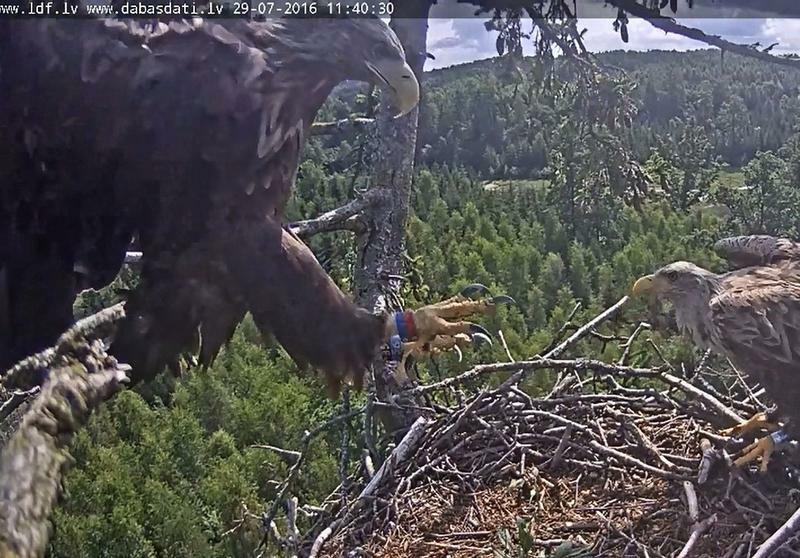 In September they started to bring sticks and twigs to the nest and began to show affection to each other. 22.2. Latvian D639 ringed 5.6.2011 in Ēdole (in Kuldīga municipality, West Latvia). This bird has been seen once before at Skrunda fish ponds on 2.10.2012. 8.9. Latvian H362 with individual code K096. 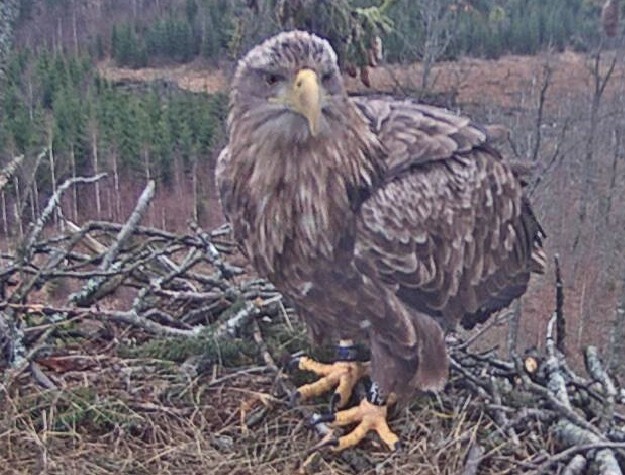 This eagle was the youngest of three siblings in the previous nest of Durbe and Robert in 2014. 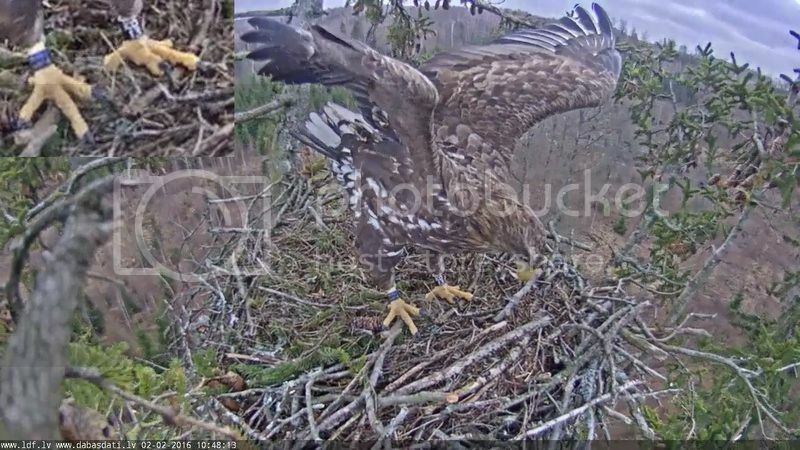 Just half an hour earlier the eaglet Durberta was seen flying away from her nest forest for the last time. 23.9. Latvian K096 again, this time with very dirty feet. 7.10. Latvian K096 again, still with very dirty feet. 20.12. Latvian H321 with individual code K055, ringed on 6.6.2013 at Liepāja lake, near the city Liepāja on the West coast of Latvia . This was the first control sighting of this bird. 26.12. Latvian K014 ringed 31.5.2012 in Kurzemē (West Latvia). This was the first control sighting of this bird. 2.2. Latvian K013. 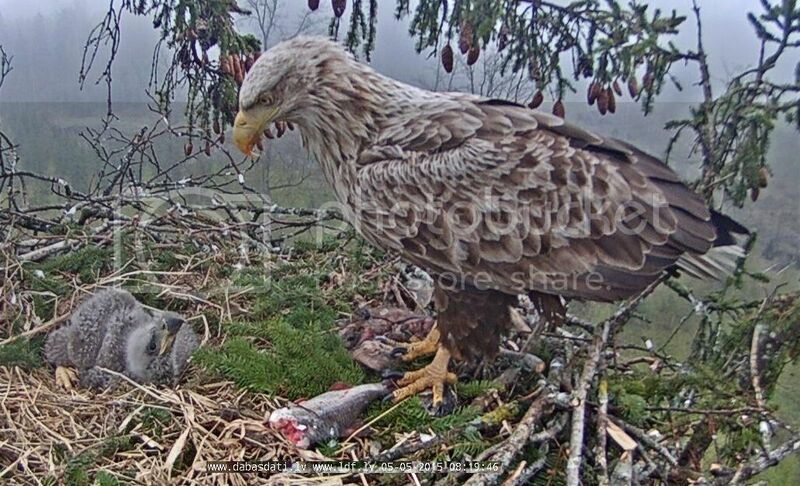 This eagle was ringed on 29.5.2012 in Kurzemē (West Latvia). 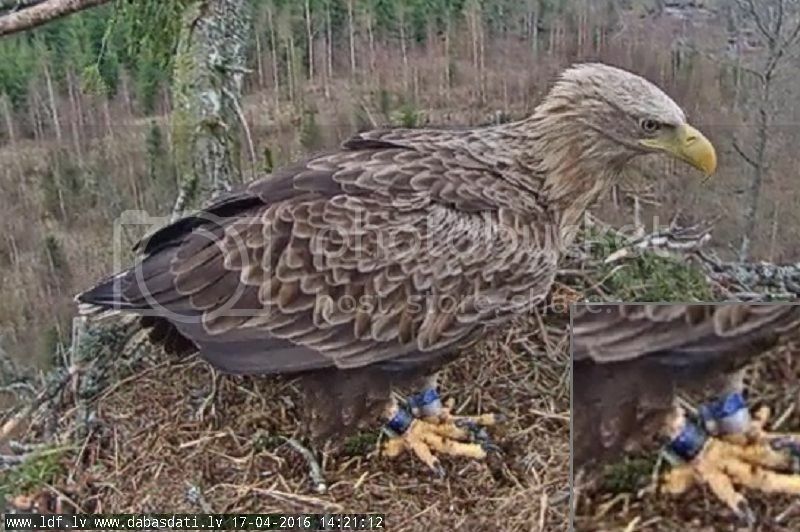 This is the first control sighting of this eagle. 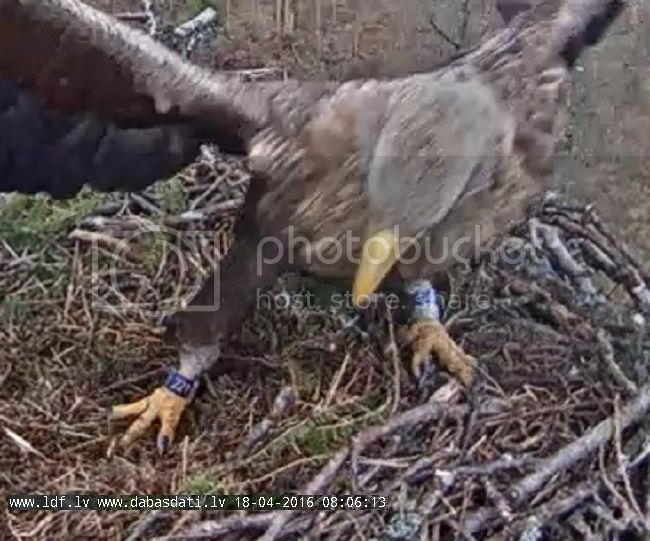 This eagle is not a sibling of K014 who was seen on the nest on 26.12. a few weeks earlier, since these two eagles were ringed on different days. 3.2. Latvian K055 with H321 on the country ring was observed by the members of the Dabasdati forum. This bird was first seen at the nest on Dec 22 last year. 13.2. Latvian K055 with H321 visited the nest again and again the Latvians saw it. 23.2. Lithuanian L049. 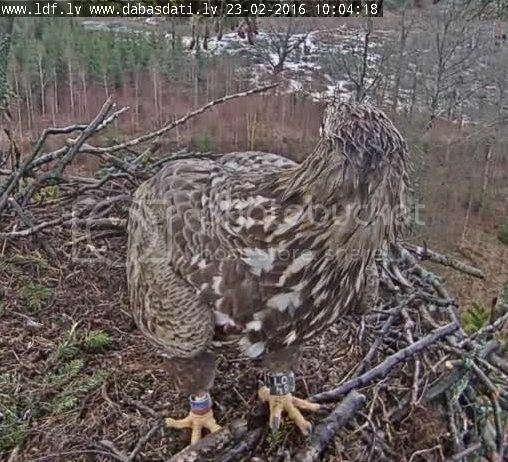 This eagle was ringed on 16.5.2013 in Nemunas Delta Regional Park in Western Lithuania by Dave Dementavicius in a nest with two eaglets. According to measurements it is male. 14.3. Latvian K013. 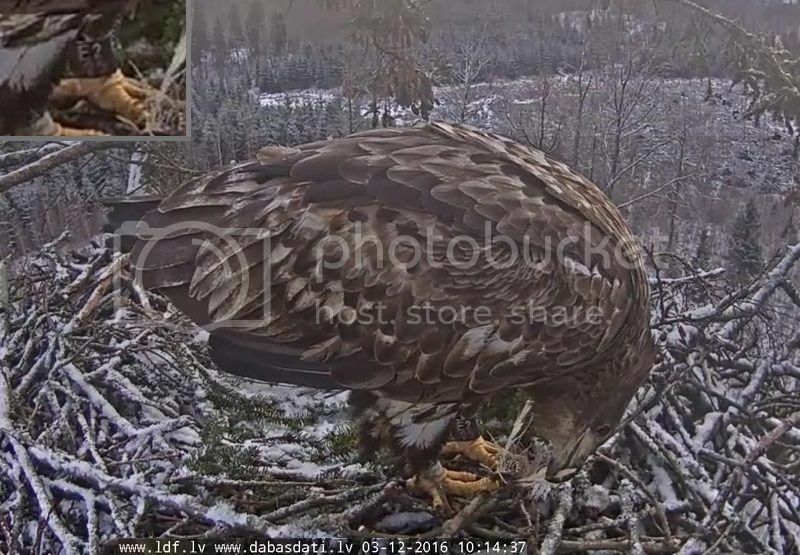 This eagle was seen on this nest already on Feb 2 2016 (see above). 15.3. Latvian K055 with code H321 on the country ring. This eagle has been seen on this nest already on many occasions (see above). 15.4. Latvian K018. 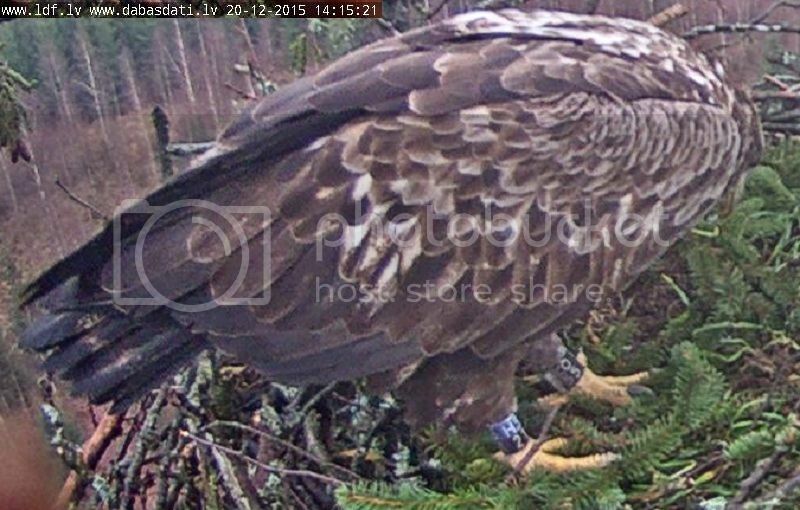 This eagle was ringed on 1.6.2012 in SW part of Kurzemē region (West Latvia) by Jānis Ķuze. It was the only chick in the nest. This was the first control sighting of this bird. 17.4. Latvian C602. This eagle's ring codes were difficult to read. 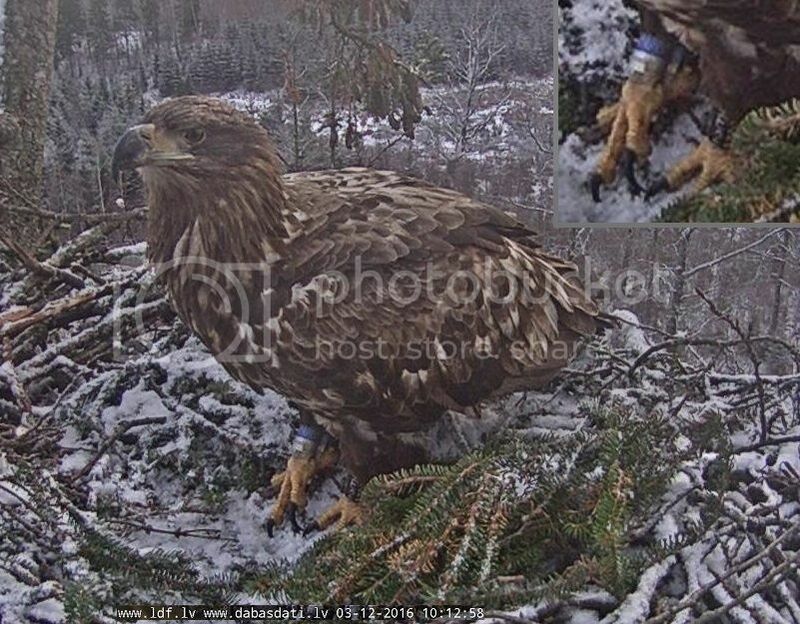 The right ring showed it was Latvian and the colours of the left ring showed that it was ringed in 2010 so the letter in the individual code had to be C. Fortunately this eagle kept coming to the nest repeatedly so it was possible to get better pictures of the codes. It was also soon discovered that the first number was 6. The last two numbers required more pictures but finally they could be read: 02. Also the numbers on the right ring were readable: 221. This allowed the identification of this bird: C602. 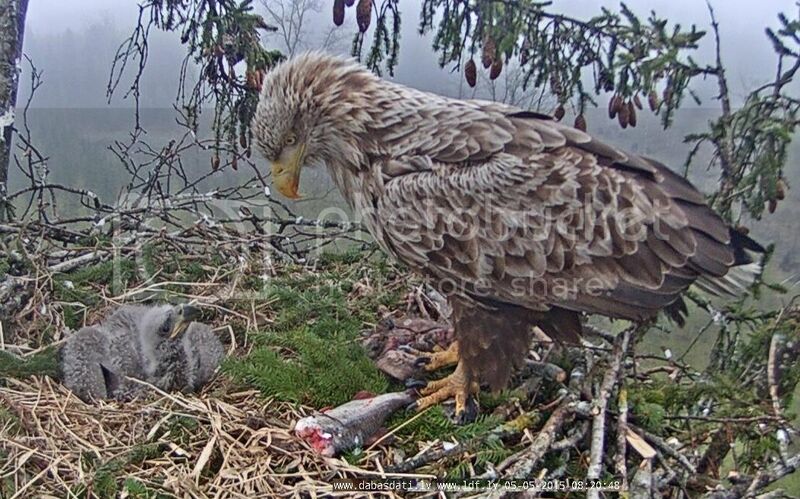 It was ringed on 5.6.2010 in Kurzemē region (Kuldīgas side) in a nest with two eaglets. 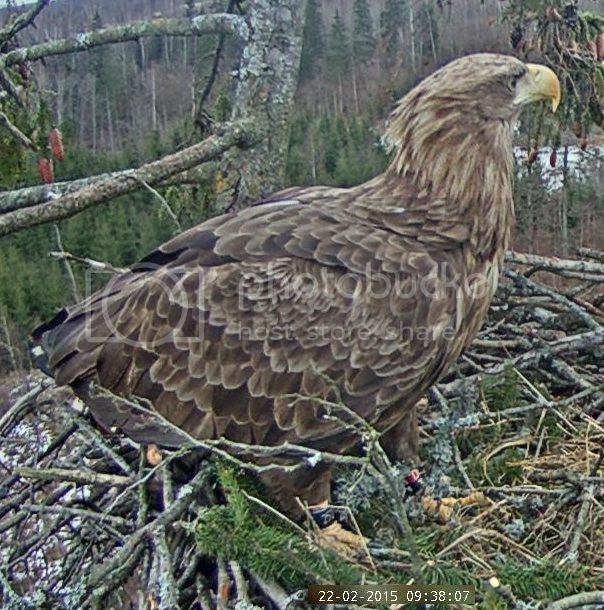 The visits of this bird on this nest are the first control sightings of this eagle. The same bird probably visited the nest already on 29.3.2016 but then only the C6-part of the code was read. 28.4. Latvian K055 with H321 visited the nest again and again the Latvians saw it. 6.7. Latvian C593 with numbers 210 on the right ring. It was ringed as a nestling near Aizpute on 2.6.2010. This was the first control sighting of this bird after the ringing. 29.7. Lithuanian B556 together with the Latvian C602. B556 was ringed as a nestling on 30.5. 2009 in Šilute district, Lithuania by Deivis Dementavicius. The bird was captured in a picture taken with an automatic camera on 30.9. 2011 at a nest in Kurzemē (Tērandes side), Latvia. These two eagles seem to settle together and begin to build the nest in September. 16.8. Latvian K055. This eagle has been a frequent visitor on this nest (see above). 21.10. Latvian K055 with H321 visited the nest again and again the Latvians saw it. 30.10. Latvian K055 visited again. 3.12. Estonian E225 visited the nest. 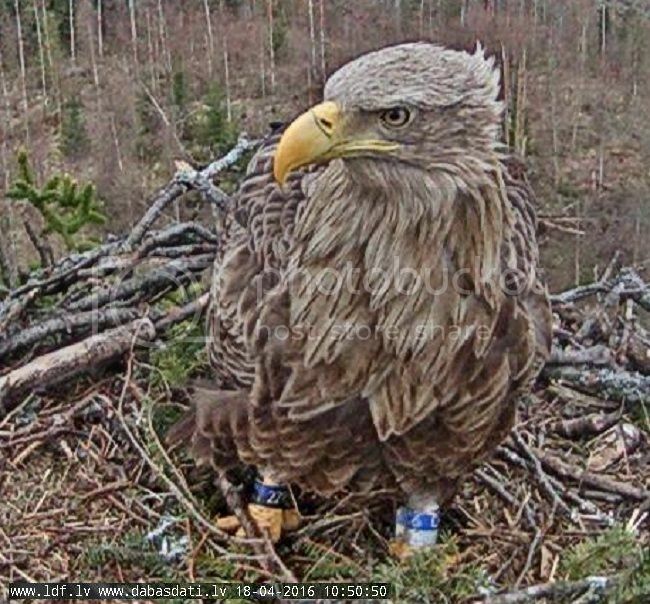 This eagle was ringed by Renno Nellis on June 9 2015 in Läänemaa county as one of two chicks. the camera has started as scheduled. I hear a tawny owl. 8:35 someone else landed on the tree top and the young took off. Liz, did you hear two take-offs? i think i heard. 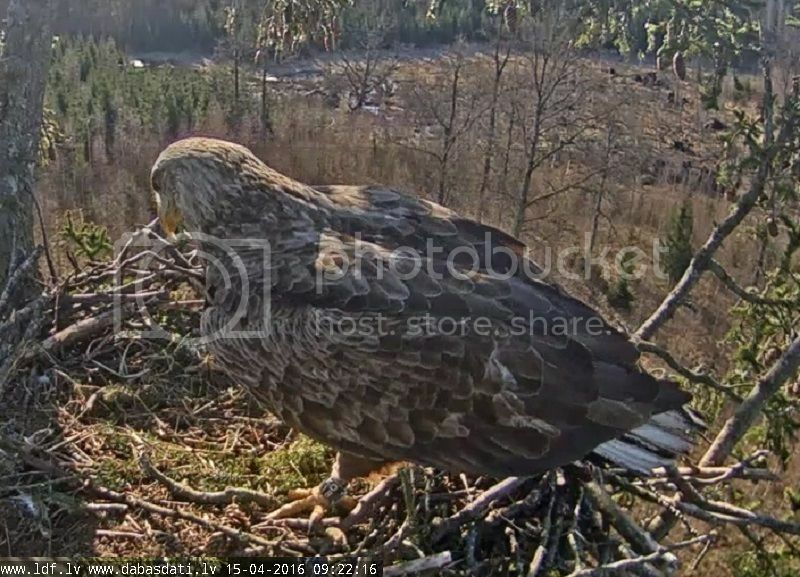 eagle on nest - same as yesterday? it was un-ringed again and looked like the same as yesterday and this morning. it's a lot of traffic here.